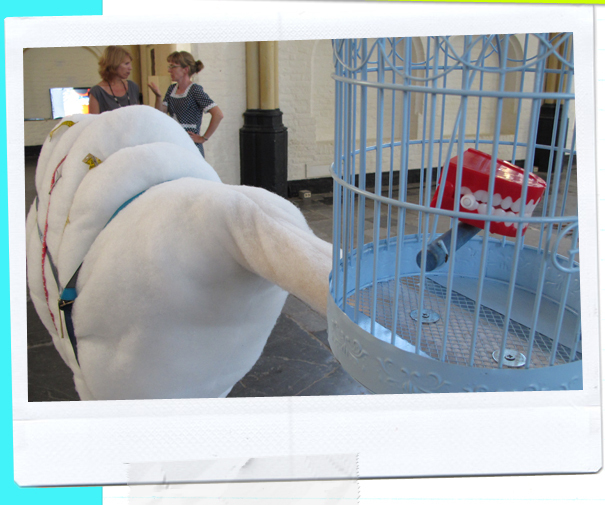 A detail of my suclpture ‘Watje-Bijterje’ (Softy-Biting), it makes people laugh because the sculpture stands on seven weighing scales. This sculpture is shown at the exhibition’ From the heart’ at the Bergkerk in Deventer. With Caro Bensca, Merijn Bolink, Sindy Butz, Floor Coolsma, Anneke A. de Boer, Sebiha Demir, Helen Frik, Hans Hovy, Filip Jonker, Marleen Kappe, Arno Kramer, Christoph Krumpel, Marianne Lammersen, Mirna Limon, Eva Meschede, Ekaterina Mitichkina, Maria Neumann, Linda Nieuwstad, Daphne Riedijk, Jacomijn Schellevis, Karin Schipper, Nicole Schulze, Saske van der Eerden, Nikki van Strien, Anne Wenzel. Arno Kramer, curator, artist and former teacher at the AKI sculpture department curated the exhibition ‘From the heart’ at the Bergkerk in Deventer in collaboration with Kunstenlab Deventer (NL). Arno Kramer made a selection ‘from the heart’ of former AKI Sculpture students and AKI colleague teachers. The exhbition runs from 1 – 30 October 2011.